OK, so brewing with bread isn’t actually a new concept, in fact one of the oldest known references to brewing dates back to ancient Mesopotamia. Evidence of this is said to be a 6,000 year old Sumerian tablet which shows people drinking a beverage (beer) through reed straws from a communal bowl. There’s also an ancient Sumerian poem honouring the patron goddess of brewing, Ninkasi, which happens to contain the oldest surviving beer recipe, one which describes the production of our favourite beverage from barley via bread. Yep, bread. So not a new idea, but one that certainly fell out of favour or was perhaps limited in some way to that time and/or region. Fast forward to 2015, to a modern day Belgian brewery and find the start of today’s revitalisation of the ancient idea. It was Sebastien Morvan of the Brussels Beer Project who most notably revived the tradition, using it as an answer to a contemporary problem; food waste. Twelve percent of food waste in Brussels is bread but by taking unwanted and unused loaves the brewery were able to fashion them into Babylone, a 7% strong bitter, and help draw attention to the problem whilst providing a way to help overcome it. It was this project that inspired the first bread-beer, in what is steadily becoming a movement, over here in the UK. It’s estimated that up to 44% of UK food waste is bread, a statistic that Tristram Stuart is trying to tackle. Inspired by the creativity and success of the Brussels Beer Project, Stuart launched the first batch of Toast Ale back in January 2016, to nationwide acclaim. The beer is a classic English Pale Ale, brewed with leftover, unwanted loaves and drinks with a full body and citrus edge. It’s a benchmark of the modern traditional pale and to think that it has been created with unwanted food makes the beer all the more brilliant. 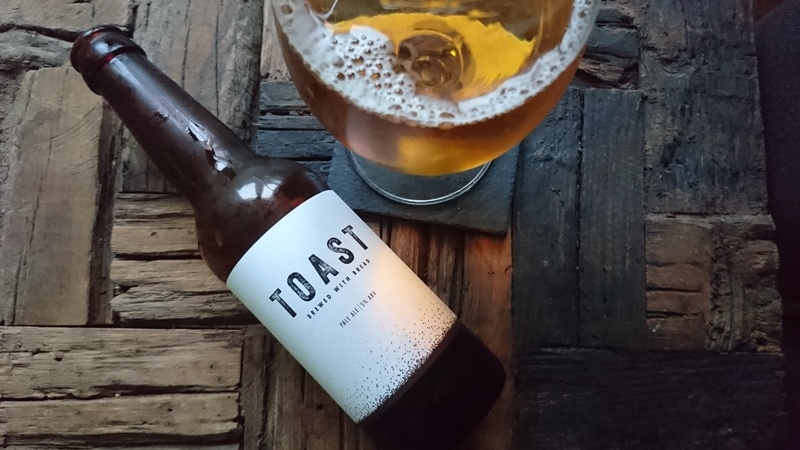 The idea has taken the Toast team all over the UK brewing with many local breweries, sharing the concept, spreading the word and sending any profits from the project to Stuarts’ food waste charity, Feedback, which is on a mission to end global food waste. Indeed, Toast is now making the first leap to a more global platform with a view to take the brand to the US. More recently though, the team have brewed up a collaborative beer with Franklins Brewing Co. of Sussex, creating the second version of the Ringmer based brewery’s Opimist beer, a brand that was initially started as a collaboration between Franklins Brewing Co and Bagelman of Brighton with the aim of reducing bread waste in Bagelman’s outlets. Optismist is described as a beer that is greater than the sum of it’s parts. It’s brewed using leftover bagels from Bagelman, and is on a mission to reduce bread and food waste in Brighton & Hove and beyond, with proceeds being ploughed back into the project plus 10% going to local charities. The first incarnation of the Optimist beer was a delight that certainly piqued my interest in all things regarding bread-beer, with its huge aromas of malts; sweet biscuit, bread and a touch of caramel over pine. Smooth and syrup-like, its mouth-feel washed bready malts and a resinous hop character over the palate, drinking like a stronger brew and strangely reminiscent of a lot of modern Japanese takes on the pale style. Sesame from the bagels was identifiable among orange and grapefruit characters from the hops. Version One was certainly a big, bold beer to kick off the brand with and the range is now onto its sixth brew. It’s a concept that seems to be spreading across the country, as more and more breweries take on the task of tackling food waste whilst having a beer in the portfolio that captures people’s imaginations and creates a talking point. And as a nation we need that. We need to be talking about food waste, we need to be tackling it on every level we can and if beer and breweries can help with that then bring it on. Meanwhile, back down south in Reigate, Surrey, and somewhat inspired by both the history of brewing with bread and the effectiveness of existing beers such as Toast, Morgan and Elaine Arnell have founded Crumbs Brewing, using surplus bread from local bakery Chalk Hills. “We love Chalk Hills,” says Morgan Arnell, “and it struck us what a frustrating life a baker must have. You put all that skill and effort into making a great product but so much of it gets left unsold or unused at the end of the day.” After a few months of tweaking, tinkering and experimenting the recipe is now dialled-in, getting the most out of the character of the surplus bread, resulting in Crumb’s Amber Lager, a Vienna style brew which was only just released at the tail end of May this year. “We’re keen that this is just the beginning,” Arnell continues, “Not only do we want to brew using different varieties of bread, we also want to apply the concept of repurposing artisan products to other ingredients.” And with many of these projects, Crumb’s are also keen to support good causes such as the local food bank and community cafe. Cafe culture has become a big deal in the UK where approximately £7.9bn was reportedly spent in coffee shops in 2015. Non-specialist outlets such as supermarkets and pubs have also jumped on the bandwagon, enticing people in for a relaxed beverage and a sarnie, heck, you can’t even go to a garden centre without tripping over a coffee shop these days, so imagine if each community had a local brewery that teamed up with local cafes and restaurants in a similar way to that of the Franklins and Bagelman project, then we could have the waste-bread stats slashed, couldn’t we? And where the likes of these outlets produce surplus bread products they could in fact come full circle and sell the bread-beers that could be produced from the leftovers. Sure it’s a big ask to get every community thinking in those terms, but with the like of the aforementioned breweries and the projects that are already underway and proving popular it just goes to show that it can be done, and the message is spreading, with Waitrose recently picking up the Toast Pale Ale the concept can now reach an even wider audience. Of course, the ‘throwaway’ and ‘instant’ culture our society has become accustomed to isn’t going to change overnight and it’ll take more than a few brewing projects to change that but it’s a start, and with all things beer going through a boom at the moment then packaged brews become a great billboard for the movement of ending food waste, even more so when those bottles and cans are able to be recycled themselves after use. It certainly feels as though we’re entering a movement here, a brief one though as surely the concept, by definition, is transient. The idea is to end food waste, to put an end to the surplus, so if and when these beers fulfil their purpose and succeed then they will be no more. Right now though i’m happy to toast to beer playing it’s part or, as Bagelman say, “The optimist sees the bagel, the pessimist sees the hole”. Great article, enjoyed reading it! I was actually at the launch of the Brussels Beer Project myself a couple of years ago when I lived in Belgium. I had no idea they inspired bread beer.